Scientific Climate Systems has over 40 years of experience in designing and constructing dry rooms with the highest standards in mind. View our dry room design and considerations below in conjunction with the numbers in the image to the right. Custom Built IDS Desiccant Dehumidification Unit, complete with integral controls, process air humidity extraction, reactivation air system, make-up air and moisture laden heated exhaust air. Supply Air Duct, tightly sealed to prevent moisture migration. Return Air Duct, tightly sealed to prevent moisture migration. Make-up Air Ducts, to provide fresh air to room, for personnel and to overcome owners equipment exhaust. Exhaust Air Duct, to remove hot moisture laden air from desiccant dehumidification. Modular Wall System with air tight seals, fire retardant construction, metal facing on both sides of insulation to prevent moisture migration into the dry room. Custom colors are available. Airlock for normal personnel and equipment entry. Heat Rejection Unit or Condensing Unit, used to remove dehumidifier reactivation heat as well as owner equipment, people, lighting and make-up air heat loads. 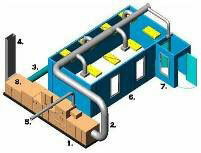 These units can be installed outside of the building for efficiency. The same high standards are also applied with our environmental test chambers. 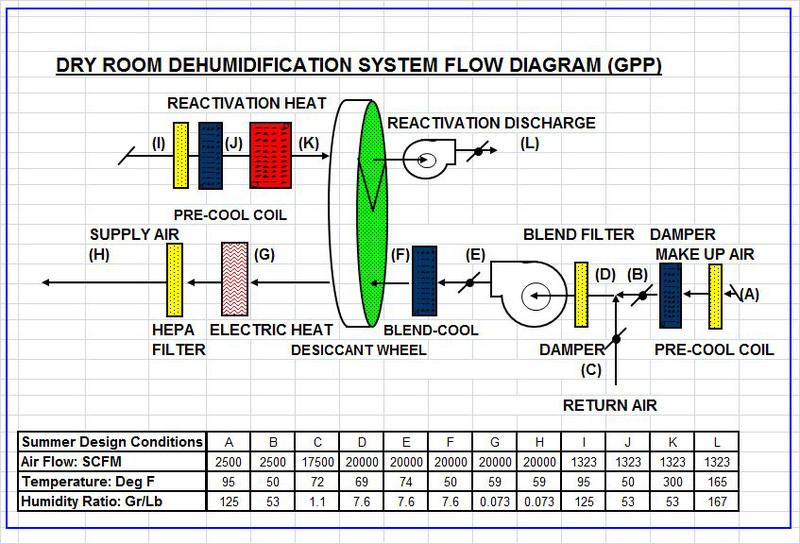 This Dehumidification Flow Diagram represents the latest technology available to condition and maintain extremely low dew point dry rooms for Lithium Battery process applications. SCS constantly evaluates vendors to select the most energy efficient performance based designs to provide long term operation reliability. This design offers low maintenance for cost effective monitoring and servicing.